Propelled by the rapid urbanization brought on by rising government & private spending on the development of residential complexes, furniture market is expected to consolidate itself as an extremely lucrative investment ground over upcoming years. As global population continues to rise and the financial standing of consumers worldwide depicts an upsurge, the demand for residential construction would consequently experience an incline to accommodate the rising populace. Moreover, escalating demands for remodeling services across the developed nations of North America & Europe would also be responsible for stimulating the industry growth over the coming years. Meanwhile, the expanding tourism sector across numerous economies – specifically in Europe, Asia Pacific as well as Africa & the Middle East is expected to propel the overall growth of the market. The increasing number of tourist-centric service establishment such as cafes & restaurants that are cropping up in the region will hold responsibility for driving the growth of furniture industry from the tourism sector. How has the demand for wood impacted the furniture industry growth? Furniture made out of wood, historically, has been a go-to option for prospective buyers when selecting items to make a room more suitable for living or working in. The apparent preference is primarily due to the look & feel a set of well-crafted wooden furniture brings to a room. Another factor making wooden furniture the preferred option is the strength & durability of the material – being one of the oldest, wood is still considered one of the most robust raw-material options, which allows it to outcompete the furniture made out of other modern raw-materials such as plastic & metal. Bearing testimony to the aforementioned statement is the estimate by Global market Insights, Inc., which claims wood to have accounted for more than 60% of the furniture market share in 2017. Incidentally, wood also possesses an inherent advantage over other raw materials – sustainability. Wood, when harvested & sourced in a certified & responsible manner, represents an outstanding option in alignment with the current sustainability trends, as unlike metal furniture, wooden furniture does not consume extensive amounts of resources during the production phase and unlike plastic, does not pose a significant environmental threat when it eventually is disposed. According to Australian not-for-profit organization, Make It Wood, responsibly sourced wood is the only renewable building material that exists. Since more than 50% of the dry weight of wood comprises carbon, it also has environmental benefits by keeping carbon out of the atmosphere, making it a viable choice for furniture. Powered by the presence of prominent economies such as India, China, South Korea and Japan, APAC is touted to come up as one of the most preferred destinations for furniture industry stakeholders. The growth can quite overtly be attributed to the readily accessible cheap & economical labor and easy availability of a plethora of raw materials. These factors, coupled with the region’s expanding construction sector, are bound to impel APAC furniture market. The regional industry is also expected to receive momentum from the rapidly developing hospitality sector in countries such as Indonesia, India, Malaysia and China, as these nations continue to capitalize on the enhanced economy and the proliferating tourist sector. 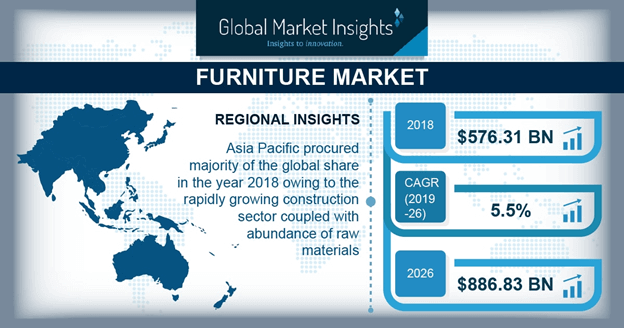 In fact, Asia Pacific is anticipated to dominate the global furniture industry with an estimated remuneration portfolio spanning a mammoth USD 400 billion by 2024. It is thus clearly apparent from the aforementioned trends that the global furniture market is primed to crop up as a reliable investment ground. Propelled by the increasing product demand across the residential construction & hospitality sectors globally, the overall furniture market size is projected to exceed a USD 750 billion valuation by 2024.